The couple danced in a close embrace with their faces touching. The waltz continued to evolve into fast “Viennese” and slow into “English” versions. Danced in both closed position (International, social and world competitive style) and the open position (American style) and also the Argentine style known as Vals. The tango has evolved into several styles. The Argentine style and the International style – danced in close embrace and danced worldwide as a social and competitive style. Another version is known as the American style which uses both closed and open position and danced only in the United States. The foxtrot, named after the Vaudeville star, Harry Fox, was danced to ragtime music and used a quick walking movement known as the trot. The dance was originally called Foxes Trot. American competition in Foxtrot began in 1914 in New York with a gold cup being given to the winners. Early innovators of the Foxtrot were Vernon and Irene Castle along with G. K. Anderson and Josephine Bradley who moved to London becoming successful competitors and forming the basis of International style foxtrot. The foxtrot in America separated into two styles, one called the “crush” – danced on the spot, and a powerfully moving and rhythmically diverse style using quicks and slows with the free and improvisational approach. The first world championships were held in Paris in 1909. The Peabody is a one step danced to fast ragtime music. It was named after a police lieutenant named William Frank Peabody an active social dancer. 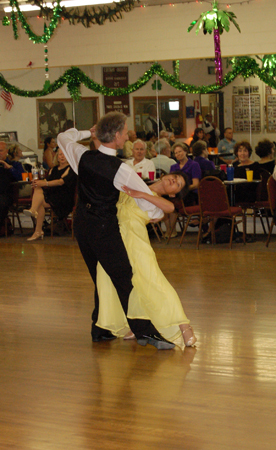 Sometimes referred to as the “fat man’s foxtrot,” because of the dances’ frequent use of outside partner positions on both the left and right sides, a technique still used today in order to execute complicated steps in close contact. The quickstep evolved in the 1920’s, from earlier dances such as the Foxtrot, the Chug, Charleston, Shag, Peabody and the Dixieland one step. The dance is English in origin and was standardized for social and competitive dancing in 1927. A quick dance with chasse (side together side), locks, runs and hops, the Quickstep has developed into an exciting and athletic competition dance. Yet in it’s social dance application it is recommended as the first dance to be taught to beginning dance students because of its easy basics and fun music.